It is imperative that you operate your new business with complete integrity and the highest ethical standards at all times. I speak with automobile dealers all over the country and the experienced dealers all agree on one thing. If you operate your dealership with the highest ethical standards and stay completely compliant, you will make the most money! Integrity and compliance equals more profits! Some dealers choose to make a few quick bucks by operating their dealership unethically and without being completely honest with their customers. By operating unethically, you will lose your dealers license within the first few months. Every state dealer license bureau has dealt with unscrupulous dealers for many years and they know every old school dealer’s trick in the book. If you don’t operate strictly under all State and Federal guidelines, your dealer license can quickly be revoked. Once you have had a dealer’s license revoked, it is very, very hard to get it back. I cannot stress the importance of operating with complete honesty and integrity at all times. I have sold many vehicles on eBay. eBay has what is called a “Feedback” system. Every time you sell a vehicle your buyer is allowed to leave feedback based on the transaction. If you described the vehicle accurately and made sure the customer had a pleasant buying experience, your customer will leave you a positive feedback. The more positive feedbacks you get, the more likely future customers will make a purchase from you. If you have several negative feedbacks, many customers will not purchase vehicles from you since they anticipate that you are dishonest and cannot be trusted. This same feedback concept used by eBay can easily be transferred to the day to day operation of your retail dealership. When a customer purchases a vehicle off your lot and has a positive buying experience, they will tell several people. As you gain many positive customer experiences, you will have one of the best reputations in your area. If your customer has a negative buying experience from your dealership, they will tell many, many people, which will give your dealership a negative reputation. Negative reputations lead to negative sales. I have also learned the dealers with the best reputations also have the highest priced vehicles. The reason for this is customer trust. A car purchase is one of the largest investments your customers will make and they want to make sure they are doing business with someone they can trust. When potential customers know you are running an honest business they will have much more confidence in the purchase. They will actually be willing to pay more for a vehicle because they know they are buying it from a business they can trust. A customer will trust much more of an investment with an honest dealer that has been in business for years instead of a crooked dealer that just started down the street. Being completely honest with your customers is a win-win situation. When you have lots of happy customers you will have the best reputation in town, you will have the highest profits, and you will be in business for many, many years. 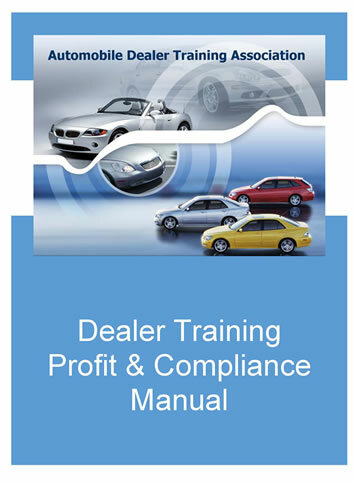 You will make much, much more money over the long run by operating your dealership with the highest ethical standards. You should work hard to earn your customer’s positive feedback so they will tell their friends, family, and co-workers about their positive experience with your dealership. The more positive feedbacks your customers spread about your dealership, the more business you will attract. Always remember how important positive feedback is to your dealership. To maintain your honest reputation you must offer full disclosure on all vehicles before the sale. Always disclose every minor mechanical malfunction that you are aware of, before the test drive. By disclosing everything you know about a vehicle before the test drive, you will build an incredible reputation in your area. If a car is pulling to the left and making noise in the rear end, I tell this to my customer before the test drive. Sometimes a customer may look at me like I am from another planet. They might be thinking, why is this car dealer telling me everything that is wrong with the vehicle? Because it builds great credibility and helps me avoid fraudulent transactions by offering full disclosure on the vehicle. Also, your customer will find these issues out as soon as he or she takes it for a test drive. By disclosing this information before the test drive, you are building your honest reputation and letting your customer know that you have nothing to hide. If you knew about these mechanical issues and did not disclose them to your customer, you could be involved in a fraudulent transaction, which is absolutely unacceptable. By operating your dealership with complete honesty and the highest ethical standards at all times, you will gain an honest reputation that will lead you to many more sales than that of a dishonest dealer. As a dishonest dealer your reputation will spread like wild fire. Once you are known as an unethical dealer it will be next to impossible to discard your dishonest reputation. Most state dealer licensing bureaus have a strict rule that may be called something like the “Attempt to Gain a Commission by Fraud” rule. Any time you attempt to put money in your pocket during a vehicle transaction by lying, deception, or under false pretenses, you are attempting to gain a commission by fraud. If any dealer attempts to gain a commission by fraud, they will be subject to suspension or revocation of their dealer’s license. There are many actions that can fall under this rule. If you run a false or deceptive advertisement, you are attempting to gain a commission by fraud. If you tell a customer the transmission is perfect when you know the transmission is slipping, you are attempting to gain a commission by fraud. If you buy a car from a person with a blank title, thereby purchasing that vehicle from someone other than the person whose name appears on the title, you are attempting to gain a commission by fraud. State license bureaus have been dealing with unscrupulous dealers for many years and, as stated earlier, they know every trick in the book. The best thing you can do in this business is operate with complete integrity and the highest ethical standards. Remember how important it is to fully disclose every known mechanical issue before every transaction, no matter how minor.